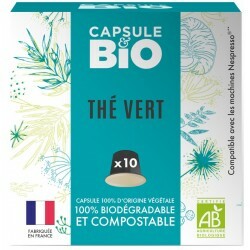 Capsul & Bio, biodegradable capsules compatible Nespresso ® Green Tea Mint Bio. This green tea is certified from organic farming. Enjoy the combination of green tea and the freshness of mint. Capsules of the brand Capsule & Bio, biodegradable compatible Nespresso ® Organic Green Tea.This Green Tea from China is certified from organic farming. All the benefits of green tea in a capsule for Nespresso ®. Nespresso ® compatible white tea capsules with passion fruit aroma. This white tea is certified from organic farming. This is the wonderful combination of the delicacy of white tea associated with the taste of apple and passion fruit. 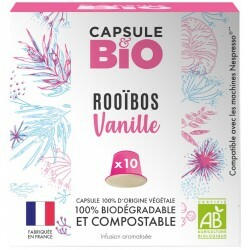 Capsul & Bio, biodegradable capsules compatible with Nespresso ® Rooibos organic caramel flavor. This tea without theine is certified from organic farming and its capsule is biodegradable. Ideal drink in the late afternoon and evening.